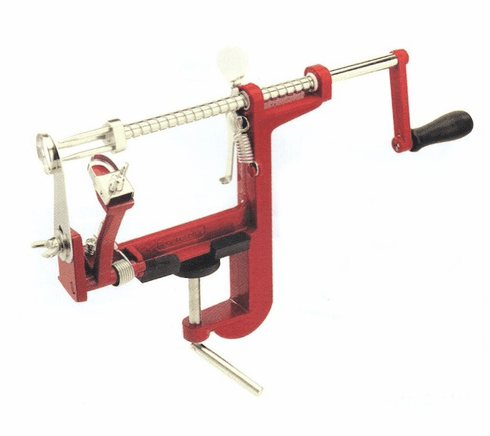 The Apple Machine- Peeler, Corer and Slicer with 2 bases Comes with 2 bases 1 x counter top clamp-on base 1 x suction cup base Reduce prep time for making pies, tarts, applesauce and more. Peel, core and slice apples all in one step. Both clamp and suction base hold securely to most counter tops. Coring/slicing blade easily removes apple core and the peeling blade adjusts for different cutting depths. Three prong fork holds apples in place. Easy turn crank handle makes peeling quick and easy. Hand wash only.